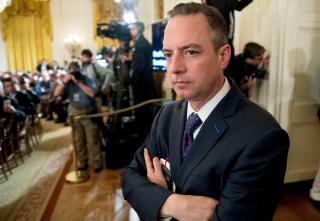 (Newser) – Reince Priebus is trying to join the US Navy. The former White House chief of staff—who resigned the post after six months—has a letter of recommendation from Defense Secretary James Mattis to help him become a reserve officer, the Washington Post reports. "Reince's experience, education, and personality make him an ideal fit to be commissioned into the Navy Reserve," writes Mattis. Priebus, who was apparently summoned to President Trump's office to kill a fly, tells the Navy he admired his sister's service as a Navy doctor and recalls his dad teaching at a naval station. He was also touched by an Oval Office meeting with the wife and children of a Navy SEAL who was killed during a raid in Yemen. Gimme a break. This guy is a sissy. At 46 how's he gonna do boot camp? Hopefully he passes the medical; he was in close proximity to those highly contagious 'bone spurs' after all..
Reince is a little on the old side to be accepted but if he can pull it off, more power to him.